The 99er has been my nemesis race since I first attempted it two seasons ago. Both past attempts have seen me finish cramped and walking, and driving home deflated and spent. So the Friday before this year’s ride was always going to be a nervous time. The extra 15km added to this year’s ride really didn’t help. 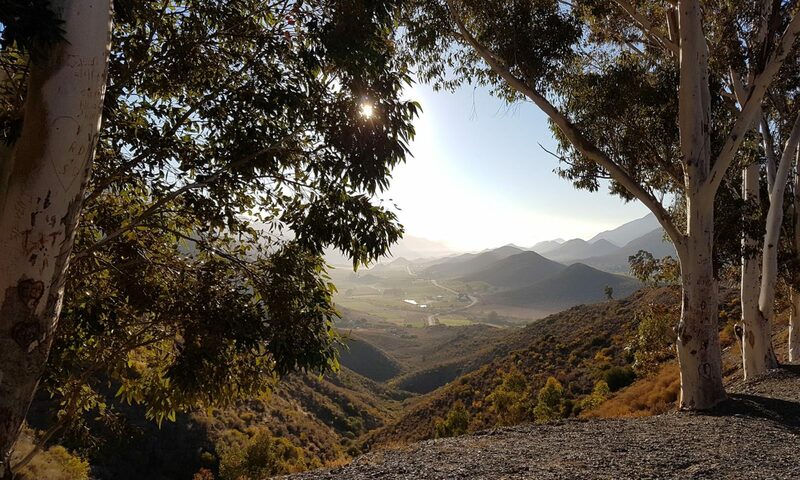 The brutal Vissershoek climb seemed more daunting than ever – I just could not envision staying in the saddle with a tough 115km already in my legs. As it turned out, facing that reality proved to be the essential step in slaying the ghosts of those past attempts. Along with my usual pre-race preparation, I also crunched a few numbers to try and determine an optimal race plan. The interesting part was that walking up Vissershoek and Odendaal Street didn’t have a disastrous impact on my overall race time compared to climbing up them slowly in the saddle – although steep, neither are particularly long climbs. On the Tour de PPA in January I went off very hard from the start to try and catch a reasonably fast bunch to help ride out the rolling hills and wind with a decent average speed. I cramped at the end, but had already done enough work to finish with a satisfying time. It seemed crazy to be considering a similar strategy for the longer and tougher 99er, but numbers don’t lie. Every way I re-worked the plan, my best race time came down to starting fast and hanging on as long as I could, even if it meant some walking on the final hills. Putting in a fast 60km as I managed on the Tour de PPA, would give me a chance at a similar race time to last year despite the longer course. Every kilometer further I could hold the pace would get me closer to a 5 hour time, which seemed far too elusive to dream of achieving. Apart from having a much more tangible race plan, I made a few other changes to my usual routine – peanut butter and Nutella sandwiches were on top of my cycling kit on the passengers seat as I left the house at 4:45am to head to the race. Normally I can’t eat much so early in the morning, but that costs energy in the latter stages of a race – so I munched away on them during the drive. I’d also only packed Perpetuem, favouring two plain water bottles and just one of energy drink, but mixed stronger. To replace the other energy drink, I’d also packed two energy bars and two gel packs. Hopefully the food and drink changes would help avoid the energy depletion I’d suffered over the last 25km of the Tour de PPA ride. It was still dark throughout most of the time I was registering, getting ready, and visiting the typically disgusting toilets that always accompany races. Having a race plan definitely gave me something to focus on as we filed into the start chutes. Get to the front, go off hard, stay with the whatever other riders that also started off fast, and work to try and either form a bunch or catch one of the earlier groups. Being at the tail of the start times in group T doesn’t give you many chances at finding a bunch – realistically there might be one or two in your group or groups behind, but miss those and you’ll be battling the wind and rolling hills solo. Dark heavy skies greeted us as we headed out of Durbanville onto the first sets of rollers. It seemed to take forever to actually settle into a group. After 25km I was still pushing a punishing pace for such a long ride, but as we swung onto the R304 and sheets of rain started falling I finally managed to catch up with a group that stuck together. It was nice and fast too – my computer was clocking a nice average of between 28 and 30km/h, although the wet roads and falling rain made it seem like we were doing that in a shower cubicle. As we approached the 66km water stop, I realised my plan was going to need some hasty patching. The cool riding in the rain meant I still had plenty of water, and so far the legs felt good despite the pace. Energy drink was another story, almost out. I knew ahead lay tough rolling hills, and quite probably wind. If I stopped to refuel, I’d lose this bunch – and most likely there would be no more behind me. Feeling very relieved I’d over stuffed my jersey pockets, I reached for the first energy bar and decide to make do with gels and snacks. Several times over the next few kilometers the bunch nearly split as it passed riders, turned corners etc. It really took concentration to see the splits and make sure you accelerated to bridge the gaps. Finally, just after we past the third water station around the 90km mark, I was done – a split happened, and I had nothing left to fight back with. I sat up, took a proper look at the lovely views of rolling farmland, swapped my water bottles over, had another gel, and relaxed into the last few solo kilometers of the ride. I was smiling though. My race plan had worked better than my most optmistic calculations: 90km clocked in not much over 3 hours; 100km came up in well under 4 hours; and I passed the argus distance of 108k in 4:06, even having stopped for that water and energy drink top-up. Even walking up Vissershoek didn’t diminish my smile – this year it was part of the plan you see. I finally crossed the line in 5:05, not a fast time by any standard, but for me an extremely satisfying result – 15 minutes quicker than last year despite being 15km longer. 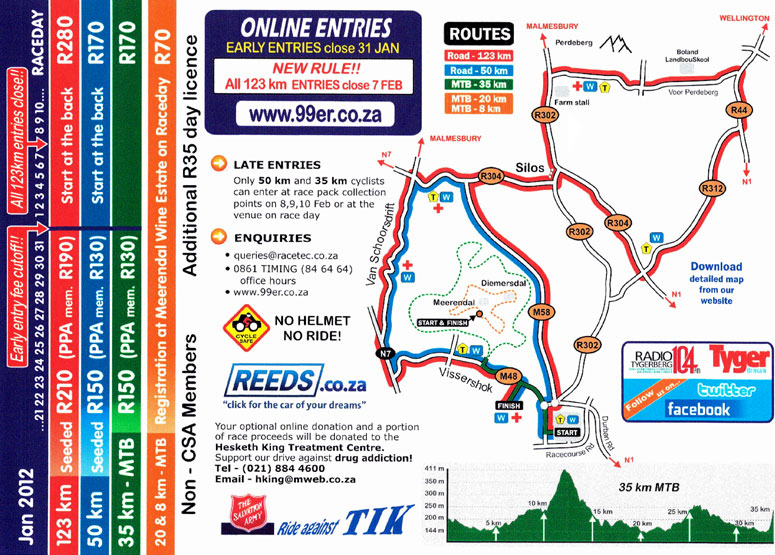 Next year my race plan will include cycling up those last two hills … maybe.